So DO Tax Cuts Create Jobs? So DO tax cuts for rich people and already-profitable businesses create jobs? DO businesses hire people when they have extra money? When few customers are coming through the door will tax cuts cause businesses to hire people to sit around reading newspapers or checking Twitter? I think that people with jobs have money to spend and then the businesses that get their business will hire people, and will make money and be happy they have profits to pay taxes on. And I think that the numbers — and charts that help us visualize those numbers — back me up. Here are some of those numbers. … in years when the top marginal rate was more than 90 percent, the average annual growth in total payroll employment was 2 percent. In years when the top marginal rate was 35 percent or less—which it is now—employment grew by an average of just 0.4 percent. And there’s no cherry-picking here. Pick any threshold. When the marginal tax rate was 50 percent or above, annual employment growth averaged 2.3 percent, and when the rate was under 50, growth was half that. In fact, if you ranked each year since 1950 by overall job growth, the top five years would all boast marginal tax rates at 70 percent or higher. The top 10 years would share marginal tax rates at 50 percent or higher. The two worst years, on the other hand, were 2008 and 2009, when the top marginal tax rate was 35 percent. In the 13 years that the top marginal tax rate has been at its current level or lower, only one year even cracks the top 20 in overall job creation. OK, got that? The periods of highest job growth correspond to the periods of highest tax rates on the wealthy. 70% top tax rates. 90% top tax rates. Maybe this is because that money gets used to build roads and bridges and buildings and ports and dams and the things that make our economy more efficient and competitive. And maybe because the years of low tax rates are the years of government cutbacks because there isn’t enough revenue coming in — infrastructure not maintained, education budgets cut, etc. What do tax rates do to economic growth? Romney says raising taxes hurts the economy. Is that what happens? The top marginal income tax rate has ranged all the way from 92 percent down to 28 percent over the last 60 years. With such a large range, it should be easy to see the enormous impact of lower rates on overall economic growth, as conservatives routinely claim. Years with lower marginal rates should boast higher growth, right? That’s definitely not what happened. In fact, growth was actually fastest in years with relatively high top marginal tax rates. Back in the 1950s, when the top marginal tax rate was more than 90 percent, real annual growth averaged more than 4 percent. During the last eight years, when the top marginal rate was just 35 percent, real growth was less than half that. Altogether, in years when the top marginal rate was lower than 39.6 percent—the top rate during the 1990s—annual real growth averaged 2.1 percent. In years when the rate was 39.6 percent or higher, real growth averaged 3.8 percent. The pattern is the same regardless of threshold. Take 50 percent, for example. Growth in years when the tax rate was less than 50 percent averaged 2.7 percent. In years with tax rates at or more than 50 percent, growth was 3.7 percent. These numbers do not mean that higher rates necessarily lead to higher growth. But the central tenet of modern conservative economics is that a lower top marginal tax rate will result in more growth, and these numbers do show conclusively that history has not been kind to that theory. In the 1950s, which had one of the sharpest periods of economic growth in all of American economic history, the top marginal tax rates for the richest Americans stretched above 90 percent. Likewise, economic growth in the relatively higher-taxed 1990s was much stronger than in the 2000s. This isn’t to say that higher taxes necessarily cause greater economic growth, but it does seem to show that higher taxes do not appear necessarily to be impeding job growth, nor are lower taxes especially helpful. David Leonhardt at the NY Times looks at recent numbers, in Do Tax Cuts Lead to Economic Growth? President George W. Bush and Congress, including Mr. Ryan, passed a large tax cut in 2001, sped up its implementation in 2003 and predicted that prosperity would follow. The economic growth that actually followed — indeed, the whole history of the last 20 years — offers one of the most serious challenges to modern conservatism. Bill Clinton and the elder George Bush both raised taxes in the early 1990s, and conservatives predicted disaster. Instead, the economy boomed, and incomes grew at their fastest pace since the 1960s. Then came the younger Mr. Bush, the tax cuts, the disappointing expansion and the worst downturn since the Depression. 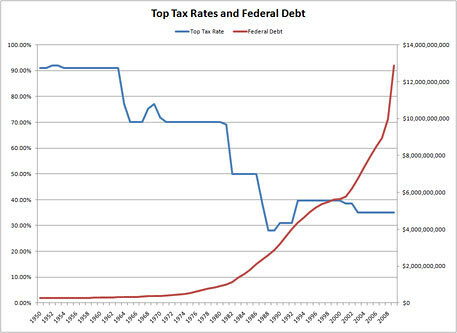 Whoa, did you see what happened after Bush cut taxes for the rich? Do you remember what happened after Bill Clinton got taxes increased on the rich? My own 2010 post, Did The Rich Cause The Deficit? 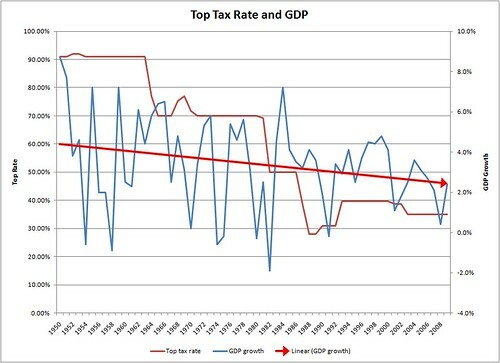 included this chart, (The red line is the tax rates, the blue is growth and the red arrow shows the trend. The real job creators are working people with money in their wallets. This post originally appeared at Campaign for America’s Future (CAF) at their Blog for OurFuture. 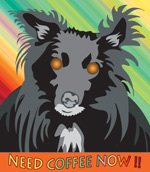 I am a Fellow with CAF. Dave Johnson (Redwood City, CA) is a Fellow at Campaign for America's Future, writing about American manufacturing, trade and economic/industrial policy. He is also a Senior Fellow with Renew California. Dave has more than 20 years of technology industry experience including positions as CEO and VP of marketing. His earlier career included technical positions, including video game design at Atari and Imagic. And he was a pioneer in design and development of productivity and educational applications of personal computers. More recently he helped co-found a company developing desktop systems to validate carbon trading in the US. 3 Responses to So DO Tax Cuts Create Jobs? This is a very cogent argument, yet I do not hear (or see) it used by those who oppose the current trend to create austerity -especially in our state institutions, i.e., our schools, state and county services. Why? It is the most amazing thing to watch people advocate and vote for policies against their own self interests! Why? Again, I am puzzled. Why is the lie -even when revealed, so powerful? The answer to this might set us back on a road to governmental and social well being. You left out the part where high taxes on the rich mean they have less money to spend buying government and generally bribing it into doing things that hurt job growth. I’m glad to see a lot more progressives picking up these straightforward arguments and simple facts. For a long time I felt like a voice crying in the wilderness. Yup, the job creators are ordinary folks with money in their pockets. You can actually take this analysis back further. For example, the boom of the late 1860s and early 1870s was spurred by the high taxes and high government spending in the Civil War. (Studebaker was just one of many long lived companies that got their start supplying the Union army.) The war taxes of 1917 and on drove the Roaring 20s. Sure, there was a lot of innovation going on, but someone needed an excuse to raise wages. In fact, it was the 2-3 order of magnitude increase in manufacturing productivity combined with relatively flat wages that led to teh Great Depression. Don’t kill your baby: that’s our job! anybodywhy on Don’t kill your baby: that’s our job! "The world is a rigged game"
So, right-wingers, you want a society where families are stable, where everybody looks like you and shares your Christian faith, and where the government pretty much stays out of your business? It’s not in some Randian fantasy, it’s right here in the USA.